Beth yw ‘Cyffwrdd’? | What is ‘Touch’? With the game finally spreading out of the Cardiff stronghold with new leagues forming in Carmarthen and Newcastle Emlyn, there has never been a better time to get involved in touch. This is one of the few sports in which men and women can compete together on the same field, creating a truly unique playing atmosphere. Gorllewin Gwyllt taks to Miriam Evans, one of the Wales Women’s most experienced players. 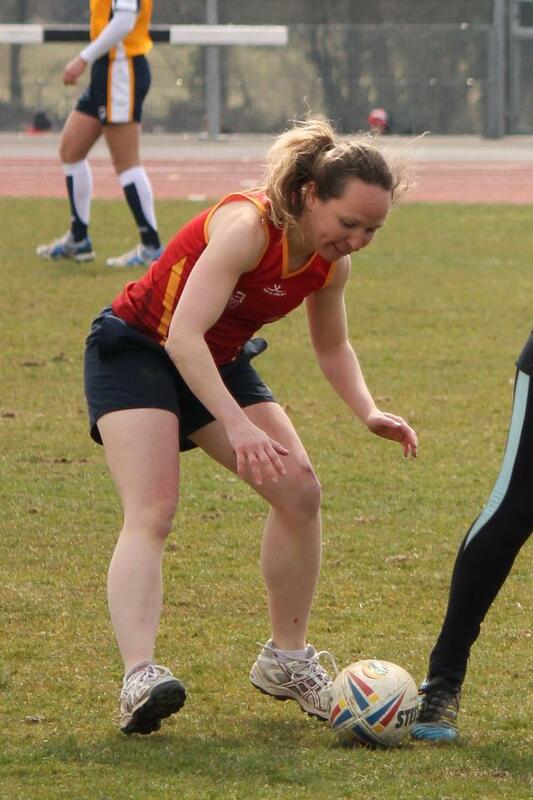 Originally from Tumble in west Wales but based in London for the last few years, she recently represented west Wales at the inaugural Wales Touch Nationals. Here she discusses how and why she started to play touch and why she thinks more women should take up the game. If you like throwing a ball around, you should take up touch. If you like running, you should take up touch. If you like team sports, you should take up touch. I played hockey and netball whilst in school but then didn’t continue either once I left. Later when I was 21 I started to play rugby by accident really after being persuaded to go along for one training session to see what it was like. The rest as they say is history as I haven’t stopped playing since. What I rediscovered was how much fun playing a team sport is and I couldn’t believe I hadn’t started earlier or continued with another sport after leaving school. It is something I have always regretted. Rugby then led me to touch and recently I’ve gone back to hockey, after 16 years away from it (I have to do something when I retire from rugby!). I got into touch because of the boys at my rugby club. A touch league had started locally and they realised if they found a couple of girls, willing enough to play with them, they would get two games a night (one mixed and one men’s). So that’s where I started one summer with the aim to keep fit out of season, improve on my handling skills ready for the start of the rugby season and to socialise. My first impressions was that it was very different to rugby tactically (even to sevens), it was fast paced, very competitive and also those from the southern hemisphere were a lot, LOT better than us as they had been playing since they were kids! I loved the competitive element of it and also the fact that it can be mixed sides. In addition it’s an honest sport – which is very important to understand as it is so fast paced. I quickly moved from playing one to two games a night (the rugby girls set up a women’s team in the social mixed league in my second year so that we could also play two games a night! ), and progressed to two nights a week then three! What keeps me playing touch? I love it! The beauty of touch is you can play it at any age at any level. I intend to play until I can’t play anymore. It is likely to go beyond my rugby playing days. Competitive wise I hope that in the future the women’s side of the sport will grow so that we could also have an over 35’s and 40’s side like the men do. I can see me always playing social touch. Touch is both an exciting game to watch and play. It’s end to end action a bit like basketball in that respect. It’s got a great social/community feeling about it. It’s a great way of meeting people from all over the world not just locally. For girls/women there are not many sports that you can have men and women playing together at the same level together. It’s great for fitness too. If you like throwing a ball around, you should take up touch. If you like running, you should take up touch. If you like team sports, you should take up touch. If you like competitive sports, you should take up touch. If you like social sports, you should take up touch. I thought the set-up in west Wales was excellent. Very well run and organised with great training venues. I was impressed with the coaching levels and also the team spirit that was built up in a relatively short period of time. But what I loved the most was the amount of young people in the squad keen to learn and get involved. It was great seeing new talent coming through and maturing during the competition. Everyone knows that west Wales was very much a developing team, with the most newcomers to the sport compared to the “internationally” stacked Cardiff and east Wales squads, yet I believe it was the squad that showed most improvement during the tournament and we certainly did not let ourselves down. I therefore think that 2014 is going to be even better for the west Wales team as they grow and develop even further through attracting new players and continued training, ready for next year’s tournament. 2014+ the Barcitiaid Coch/Red Kites will be a team to reckon with! If you’re interested in starting to play touch, there are now a number of opportunities to do so across west Wales. 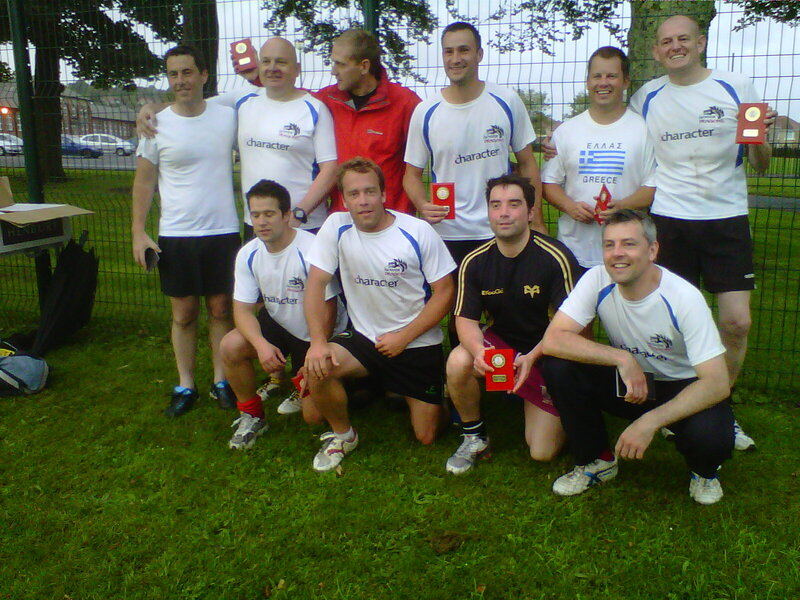 In summer 2013, there are league modules in Llanelli, Carmarthen and Newcastle Emlyn, plus the newly-formed Wales Touch Series comes to Llandysul on Saturday 8th June. For more information, get in touch! What about you, are you looking to get involved in touch for the first time this year? Are you in a team that wants to attract more female players? Leave your comments below. How Much is Touch Worth? Touch requires minimum equipment; a ball, an area to play on and that’s about it. However, there is a whole sliding scale of optional extras which can have a huge impact on the player’s ‘experience’ and therefore the price. When you look at organised fitness activities such as Spinning classes or Yoga, you would expect to pay around £5 for 45-60 minute sessions. What you are paying for is the knowledge that you are lead by a trained instructor, using suitable, safe equipment in a suitable venue, where you can have a shower and change afterwards. The going rate for playing 5-a-side football is similar. To play a weekly 30-40 minute match with 5-a-side national operators Leisure Leagues, costs from £22 -£35 per team. In other words, it’s at least £4.50 per player, per game. For this you get trained referees, good playing facilities, weekly programmes and an excellent website with fixtures and results for your league regularly updated. Touch leagues usually charge a season fee per team rather than per head. To keep the maths simple, let’s assume that the costs are based on 10 players playing a 10 week season. For example, if your team fee is £250, each player pays £25 per season, which is £2.50 each per game. Based on this, I’ve come up with pricing options and what I think are reasonable expectations based on each price. I’ve done a quick check of prices to play Touch in three random locations. These are all well established leagues with many teams already competing each summer. This is based on the most up to date prices on league websites (either 2012 or 2013). The price is the fee per team, per season (8-10 games per season). An interesting comparison between playing in the capital of Wales and our English counterpart. It costs almost double the amount to play Touch in London’s Regent Park, although you do get a snazzy t-shirt, slightly longer match time and the honour of playing in the Queen’s back yard. Priced out of the game? To pay a few pounds to play 40 minutes of Touch in an affiliated league seems reasonable in comparison to similar activities, but it can be a barrier to some. Recent statistics show that adults in the most deprived areas of Wales were more likely to report no physically active days each week. Can it be true that less well off people are less inclined to take part in physical activity in their leisure time? Is the cost of many activities the reason for this trend? 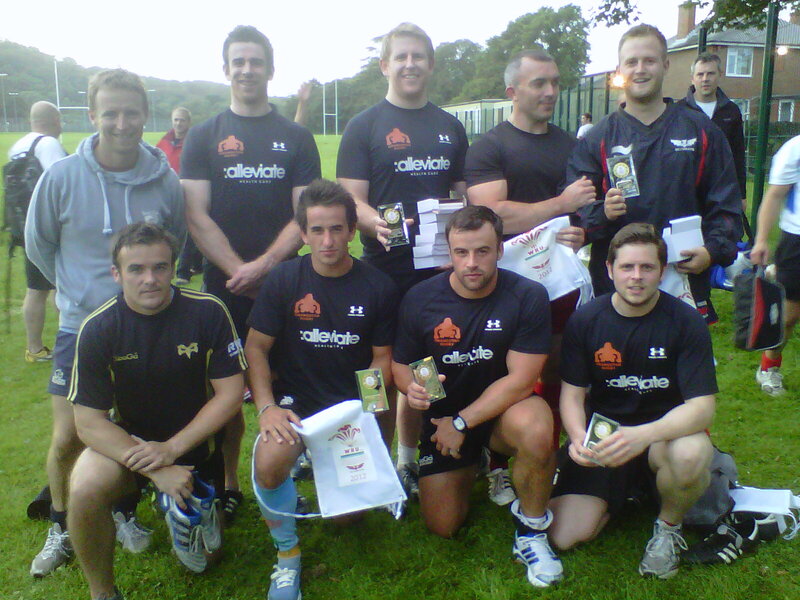 The WRU will soon be announcing their fees for 2013 Touch leagues around the country. If they are to hit their ambitious participation targets for what they are terming ‘Leisure Rugby’, i.e. Touch, then they are going to have to consider their season fees very carefully so as not to exclude large proportions of the Welsh community – the majority of which are not currently participating in sport. After all, what is preferable, a large number of people playing the game, but paying less money, or a small, elite group paying a premium? When Sport Wales is funding the WRU to employ 14 full time Participation Officers to the tune of £400,000 over the next three years in order to bring the game to masses, surely the former is the case. Let’s hope the 2013 pricing structure is more Hailey Park than Regent’s Park. Gower Dragons are impressive in their 6-2 win over 2011 champs, Orangutans to take the CSGT title for the first time. New boys, Y Mellt beat Y Genhedlaeth Nesaf to take the third spot. Gower Dragons were the only team to maintain a perfect 100% win record throughout the 2012 competition and were living proof that youth is no match for experience. The Dragons driving game, as well as sound defensive organisation made them very difficult to beat. They are also the best team in the league from 5 metres out, invariably coming away with a score from a quick role ball and split on the 5. It will be interesting to see how they fare in the newly-formed Wales Champions League when they will come up against some of the best teams from across the country. In the first semi-final of the evening the Dragons faced Y Genhedlaeth Nesaf. Despite a brave performance, YGN were unable to answer the Gower’s quick plays in the final quarter of the field and they were outscored 6 scores to 4. Favourites, Gower Dragons were now through to the final and were confident of a victory whoever they were to face. In the other semi final, great rivals Y Mellt faced reigning CSGT champions, Oragutans in a very close-fought game. At half time the scores were locked at one a piece and the score wasstill tied at 2-each at the end of regulation time, forcing the game to go into a ‘drop off’. Each team was eventually down to four players before Orangutans were able to get the all-important winning score to run out 3-2 winners and book their place in the final. All was not lost for Y Mellt, however, and this time they were the right end of a 3-2 score line, beating Y Genhedlaeth Nesaf in the 3rd place play-off game. Both teams will be back for CSGT in 2013 after their maiden season of Touch confident of improving their final positioning. Then it was time for the final game of Cyffwrdd Sir Gar Touch 2012 with Gower Dragons facing the 2010 and 2011 champions, Orangutans. Again, the Dragons ability to make ground very quickly with their driving game forced the Orangutans on to the back foot and they were unable to stop the Dragons racking up a number of quick scores. Orangutans managed to score twice and showed promise of scoring more, but ultimately it was the Dragons that were victorious, running out convincing 6-2 winners and rounding off a perfect season of victories! It was another great season of Touch in Llanelli in 2012 and we now look forward to see how our top four teams fare against the best that other Touch leagues across Wales have to offer in the Wales Champions League. Thanks again to everyone that helped make CSGT12 another resounding success, especially the referees who make the game possible. Special thanks also to WTA Referee Director, Kevin Hobbs, who not only was able to provide valuable referee coaching throughout the season, but also ended up refereeing three games during Playoffs Night too! Gower Dragons finish the campaign with their unbeaten run still in tact! Orangutans lose their title to the Dragons but finish second. Gower finish the regular season with nine wins out of nine. 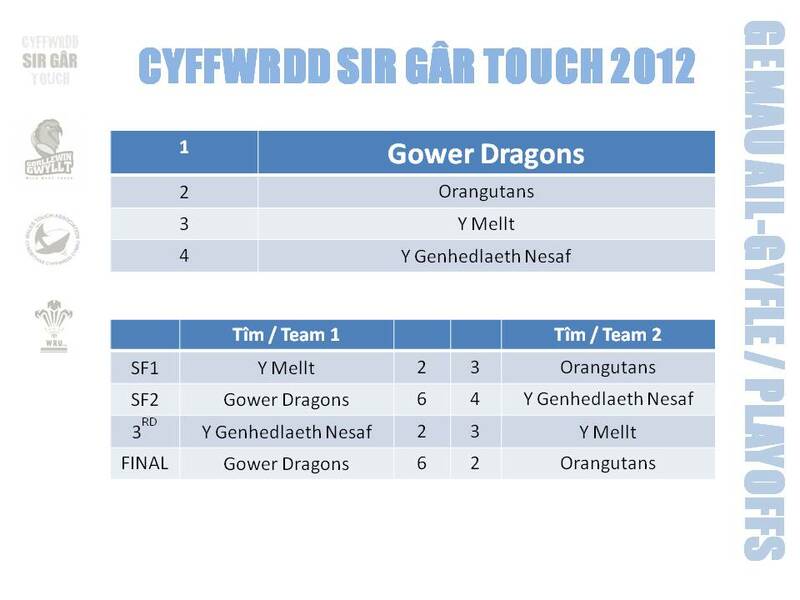 Y Mellt and Orangutans draw, with both teams securing a place in the play offs. Y Genhedlaeth Nesaf take the all important fourth and final play off spot. In the first game of the evening, Y Genhedlaeth Nesaf are narrowly beaten in their rearranged fixture against Y Mellt five scores to three. This leaves Y Genhedlaeth needing to win their second game of the evening to guarantee a play off place. They do so by pulling a victory out of the bag with a narrow 6-5 victory of much improved, The Friendly Rivals. Elsewhere, Both Once Were Athletic and Lookilikies gain walk over wins with Hyrddod yr Hendy and Charlie’s Angels both unable to fulfil their fixtures. Once Were Athletic miss out agonisingly on a play off place by a single point and will be disappointed to note that dropping points with 5-5 draw instead of a victory in Round 6 against Lookilikies may have cost them a place in the play offs. Gower Dragons make it 100% wins for the season with a win, 8 scores to 5 over No Dropped Balls and are clear league winners by three points. The Dragons have scored 61 times this season and conceded 29 scores. Following this, it’s an exciting 3-3 draw when 2nd place, Y Mellt play 3rd placed, Orangutans in what will be a pre-cursor to the play off semi finals. Y Mellt finish above Orangutans only by virtue of their superior points scored difference. They are the league’s highest scorers with 76 and have a +/- of 41, closely followed by Orangutans who have crossed the whitewash 73 times this season, but their +/- of 27 puts them into 3rd place. 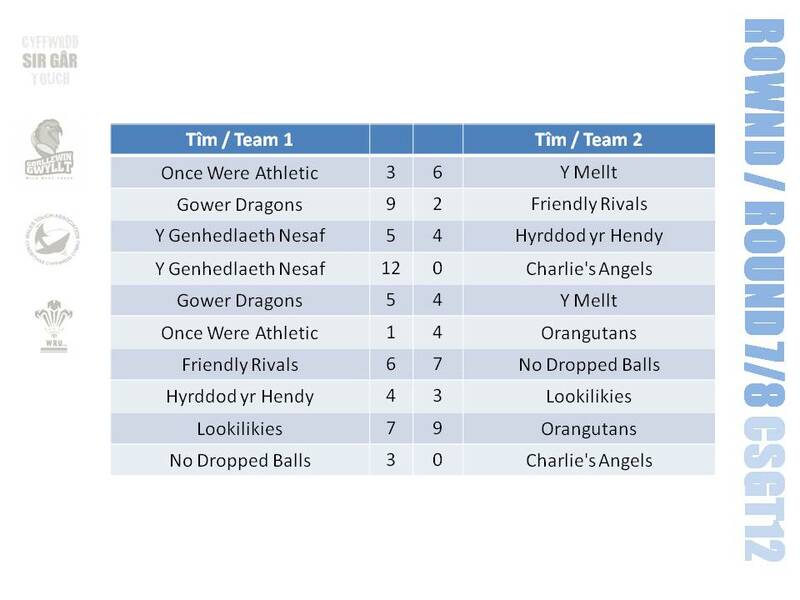 So on Wednesday 1st August, it’s Gower Dragons to play against Y Genhedlaeth Nesaf in the first semi final and Y Mellt to play Orangutans in the second semi. This is really too close to call, but it’s the unbeaten Gower Dragons who must be firm favourites to take their first Cyffwrdd Sir Gâr Touch title. 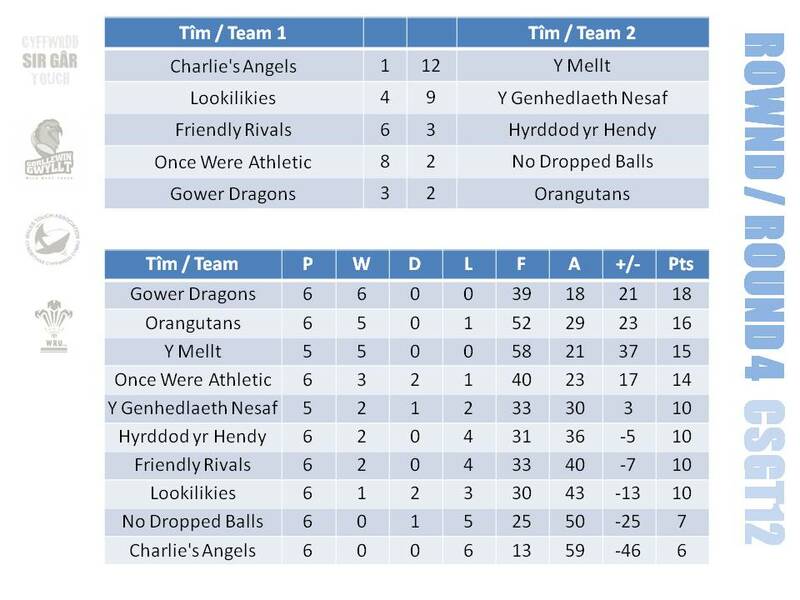 However, both Y Mellt and Orangutans lost to the Dragons by only one score in the league fixtures, so can be confident of upsetting the odds whichever team makes it through to the final. Y Genhedlaeth Nesaf may be the dark horses for the title. If they can overturn the Dragons in the semi, they will be confident of beating whoever they face in the final, although they have not managed to beat any of the teams placed above them this season. Whatever happens, it’s been a fantastic third season of Touch in Llanelli at Ysgol Y Strade this summer and we are already looking forward to CSGT13. An exciting announcement will be made soon about a regional competition, involving the winners of other leagues. Keep checking the blog for updates or alternatively, click the Follow Wild West Touch button to receive blog updates in your inbox. Don’t forget, there’s plenty more Touch to play this year, with the announcement that this year’s Pendine tournament will now take place on the 29th / 30th September. This is a fantastic social tournament and we’re strongly encouraging Llanelli teams to enter this tournament. Please contact me for more details (matt@gorllewingwyllt.com) if you would either like to enter a team or be part of a team looking for players. See Pendine Sands Tournament Is On for more details. What have you enjoyed about CSGT12? What could be improved? Comment below to have your say on how we can make CSGT13 even better. Gower Dragons take the spoils against another of their closest rivals to stay on top. No Dropped Balls get their first win of CSGT12 with an outstanding victory over the Friendly Rivals. Y Genhedlaeth Nesaf and Once Were Athletic both vie for the final Play Off position. Because of one of the wettest summers on record, we were forced to play two rounds of Touch in one evening in order to catch up on the games. The season is reaching it’s climax with only one game remaining for eight out of the ten teams and it’s nail-bitingly close at the top of the table. 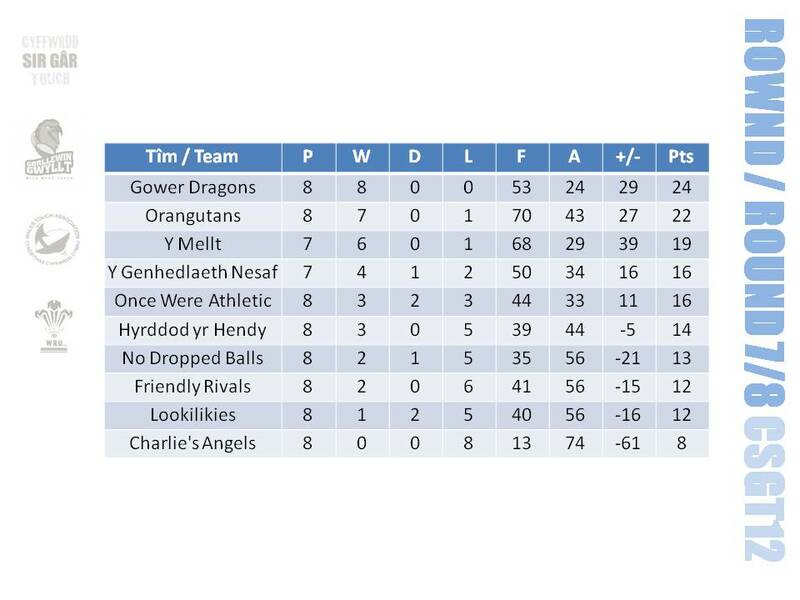 Last week they ended the Orangutans three-year unbeaten record, this time it’s Y Mellt whose winning streak comes to an end at the hands of the Gower Dragons. Gower are now the only unbeaten team left in the competition with an outstanding 5-4 win against Y Mellt. It was Y Mellt that started the evening strongly with a 6-3 victory over play-off hopefuls, Once Were Athletic, whilst the Dragons powerfully overcame the Friendly Rivals with a 9-2 win. However, Y Mellt could not overcome the Dragons in the second game of the evening, meaning that the Dragon’s 100% record continues. Looking to be involved in the end of season Play Offs, Y Genhedlaeth Nesaf’s defence held firm to withstand a come-back from youngsters, Hyrddod yr Hendy in a very close game – YGN eventually winning 5 scores to 4. And it was more of the same from Y Genhedlaeth with a convincing win over Charlie’s Angels, 12-0 – a scoreline that helps their points scored tally no end. And it is only because of their superior score difference that Y Genhedlaeth Nesaf are currently in the fourth and final play-off spot. Once Were Athletic are biting at their heels though, also on 16 points, but it is YGN five extra scores during the season that are keeping them on top at the moment. They also hold a game in hand over Once Were Athletic, but they must overcome Y Mellt in a re-arranged fixture in order to benefit from this advantage. In fact, Once Were Athletic had a very tough evening, having to play the second placed Orangutans and third placed, Y Mellt on the same evening. Whilst not managing to pick up a victory, they performed admirably and could still be a good bet for making the play-offs this year. No Dropped Balls finally come good and have an excellent evening winning both of their games. The first game is a truly fantastic win against Friendly Rivals – 7-6 and they follow that up with a 3-0 victory over Charlie’s Angels. These two wins see them leapfrog up the table in to seventh place and they could climb further with a win in their final game of CSGT12. Hyrddod yr Hendy bounced back from their close loss against Y Genhedlaeth Nesaf, with a close win against Lookilikies – eventually coming out 4-3 winners. And Lookilikies went on to lose their second game, giving the Orangutans a very close run for their money, losing only 7 scores to 9 against the winners of both CSGT10 and CSGT11. All in all, another great night of Touch in this year’s CSGT12 and it really is too close to call a winner. 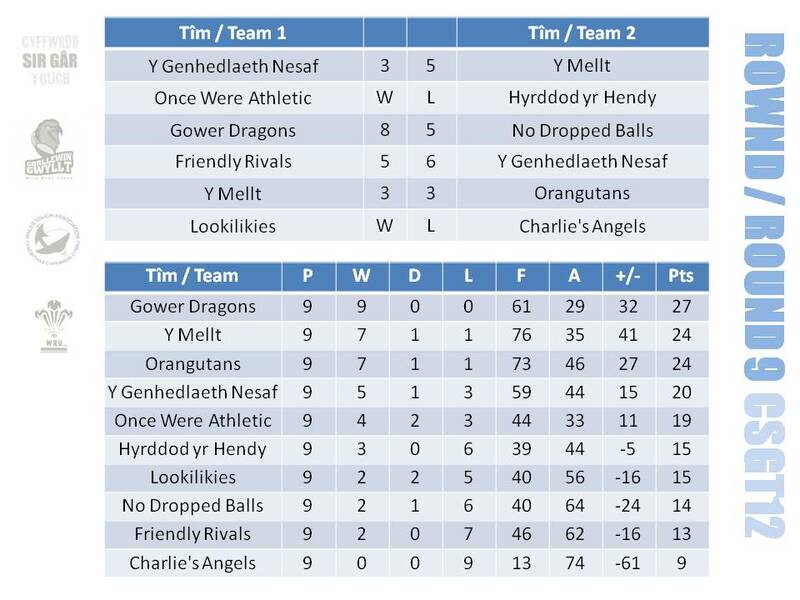 It looks like the Gower Dragons, Orangutans and Y Mellt have secured their Play Off places, with either Y Genhedlaeth Nesaf or Once Were Athletic taking the final spot. Remember there are no games this Wednesday 18th July – final league games to take place on Wednesday 25th July. Gower Dragons victorious in the top of the table clash against previously unbeaten, Orangutans! Gower Dragons end Orangtuans three year unbeaten run to top the CSGT12 table for the first time in a very closely-fought 3-2 win. As the results suggest, this was a close game and quite a fiery encounter with both teams determined not lose their unbeaten records without a fight. But it was the Dragons, with their greater experience of Touch and a number of players who have represented Wales at international level, that just edged to victory. Some poor discipline from the Orangutans did not help their cause. The Dragons play third placed Y Mellt in this weeks games, so it will be interesting to see if the unbeaten run continues. Elsewhere, Y Mellt cruised to a 12-1 win against Charlie’s Angels. Y Mellt have the best score difference in the league and this could yet come in to play as they have a game in hand on both Gower and the Orangutans. It is feasible that score difference may decide the difference between first and second in this year’s competition – making for an exciting climax to the end of the season. Once Were Athletic managed to hold on to the all-important fourth play off position by beating No Dropped Balls 8-2 and Y Genhedlaeth Nesaf are now hot on their heels, recording a fine win against Lookilikies 9 scores to 4. The Friendly Rivals managed their second victory of the campaign, with a fantastic win against Hyrddod Yr Hendy – coming out 6-3 winners. Last Call for Pendine | Siapiwch os Hoffech Ddod i Bentywyn! Could You Play Regional Touch for West Wales?